Posted: June 28, 2018; Updated July 10, 2018 Disclaimer The information presented here is for informative and educational purposes only and is not intended as curative or prescriptive advice. 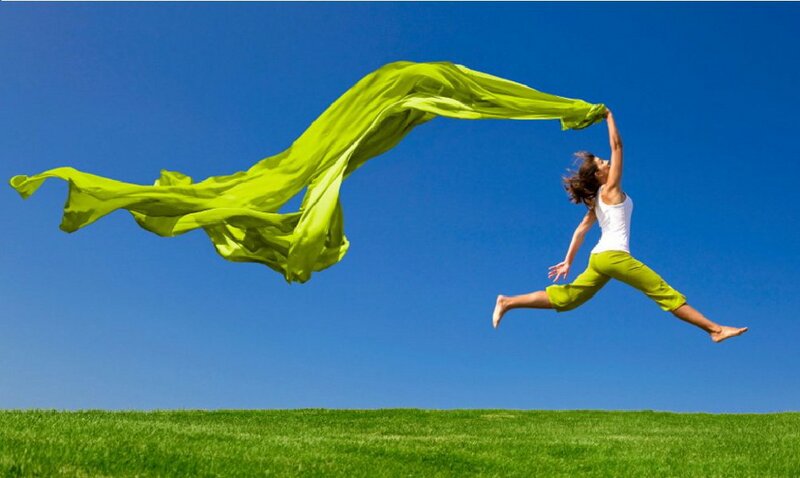 The Thrive Movement wants you to believe that the way to good health is to exercise. At least that is one movement advocated on the internet. Another is doing something to improve the body and mind. And if you succeed, then you thrive with better health. Another internet program wants to show you how to thrive by charging you money to learn to lose body weight and how to become better. It is a commercial money making enterprise. Thrive can mean many things and therein lies the problem. We need to define thrive. Online dictionary defines thrive as "To prosper by industry, economy, and good management of property; to increase in goods and estate; as, a farmer thrives by good husbandry." Thus, a baby thrives when it is gaining weight and developing successfully. A culture thrives when all of its citizens prosper and have good health. Thrive is also the name of a controversial documentary film that asks, and attempts to answer, some of the deepest questions about the nature of the human condition and what is today thwarting our chances to prosper. “THRIVE is an unconventional documentary that lifts the veil on what is REALLY going on in our world by following the money trail -- uncovering the global consolidation of power in nearly every aspect of our lives. Weaving together breakthroughs in science, consciousness and activism, THRIVE offers real solutions, empowering us with unprecedented and bold strategies for reclaiming our lives and our future." This version of Thrive documentary and the other videos about the history-origin of humans on earth are controversial, for there are two sides to the information and points of view. There are those with vested interests who suppress this kind of documentary information point of view and others with more humane points of view who support it. You be the judge of what is the truth! But do not be suckered by commercial money makers on the internet trying to sell you thrive health care, and thrive labeled foods and drinks. These are not true thrive helpers. Thrive video features Foster Gamble, who risked his money and credibility, on exposing the massive control on our food, on our health care, our energy, on our money and our education which are preventing us from thriving; that is, fulfilling our human body potentials of who we can be. I like that he is trying to create grass roots action groups throughout the world who can focus on creating alternatives on any or all of these areas. Below is a trailer or short video summary of the Gamble's documentary. Trailer about thrive documentary; Length = 3.31 mns. There is more: It may be helpful to explore beyond the information Gamble presents in his thrive documentary. This is the intent of the next few videos. How did some humans become a master blood-line race, like kings and queens, rich bankers, Industrialists and others who aspire to dominate the world? Like the New World Order? The answers may be in unraveling the history of the world. Zecharia Sitchin was an anthopologist-author who wrote and promoted the ancient astronaut theory before his death on October 9th, 2010, decades before the Ancient Aliens became a worldwide sensation on History channel. Within ufology and forbidden archeology circles, Sitchin is often credited for revealing the hidden history and origins of humanity, based on alleged alternative translations of Sumerian tablets from antiquity. However, these interpretations are hotly contested. The video below may help you understand Sitchin's theory. One of Sitchin's claims is regarding ancient sites in the Middle East in Egypt and the Palestine-Israel area, which he says were once home to space stations used by the Annunaki for thousands of years. He also claims that they were abandoned by the non-terrestrial overlords of the Sumerian people about 3,000 years ago. Mainstream archeology has yet to offer an explanation of how the Sumerian culture seemed to spring forth out of obscurity, fully formed and complete with writing, financial systems, law, building techniques and many other features of advanced civilization. The fields of ufology and forbidden archeology are replete with claims and examples of advanced beings assisting people in ancient times. But some intrepid researchers, like Graham Hancock, claim that before the diluvian period of approximately 11,000 years ago, there were many very advanced societies [lost land of Atlantis and continent of Mu], which possessed knowledge modern humans are only now beginning to rediscover. The pyramids of Egypt - despite allegedly being built by craftsman using copper-age tools - cannot be reproduced with all the splendor of modern technology. Furthermore, the little-recognized site of Gobekli Tepe [Turkey] was determined to be at least 10,000 years old, and probably much older, using standard dating techniques. And there are still other megalithic sites found throughout the world that form a growing body of evidence to suggest current views of human history are woefully inaccurate. the Anunnaki being from a planet of our solar system. that there is a 12th planet in a huge elliptical orbit of our sun in a huge planet which has been called Nibiru. "Since 2000, we have had a lot of talk about earth. We have also had a lot of political unrest in United States and other countries. According to several sources, of which Sitichin is one, the concept of the New World Order is based upon an old Anunnaki system which had been employed in other galaxies a long, long time ago. This system is now being pushed for implementation on Earth by the Anunnaki Remnants who remain on Earth, hidden in underground tunnels. These Anunnaki Remnants are the ones that were left behind on Earth by the Anunnaki Elite when they escaped this world. This sounds bezarre! 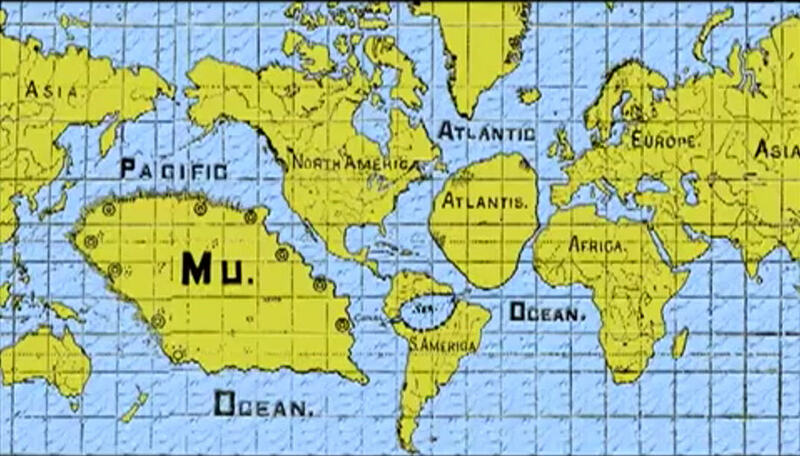 There is talk and much mystery about advanced ancient civilizations that lived on the lost continents of Atlantis and Mu or Lemuria somewhere 10,000 and 20,000 years ago [refer to Churchward's map on the left]. There is some uncertainty about the exact time when a cataclyism occurred that sank both continents. Archiologist Colonel James Churchward's granddaughter, Joan Griffith, tells her grandfather's story about these ancient places that had very advanced societies living thousands of years ago. There is considerable archiological evidence, in the nature of tablets and hundreds of megalithic ruins on land and in shallow water, that Mu existed in the Pacific. Cataclysmic happenings, like magnetic pole reversals [North and South pole axis shifts] may have caused gigantic earthquakes and volcanic eruptions that changed the surface of the world, instantly sinking the two continents and caused new mountains and islands to rise in many parts of the world. In the Pacific area, several islands emerged, like Easter island, the Hawaiian Islands and Tahiti. Historians state that over 60 million people on Mu died in the sinking of the Mu continent. Griffith: Lost Pacific continent Churchward and others surmise that many of these ancients may have been alien Anannaki who somehow survived the Mu continent disaster. And then, to give you more background information that is part of the trail about Anannuki, Churchward claims that the lost continent of Mu had a civilization claimed to have been more advanced than the one we live in today. Indeed, the theory has been proposed that it was the survivors of the ancient Anannuki people living on the lost continents that may have given rise to many of the later civilizations like Sumatra, Babylon and Egypt. There is even claim that the nuclear bomb was re-invented from the learned Anannaki people. We may not be as smart or civilized as we have been lead to believe! Churchward Lost continent of Mu; Length = 18.11 mns. Significance of all the above information: David Icke, in his chapter on 'today's network of those in power', points out that we have a secret network of those in power through out the world and that they possess many advanced secrets of civilization. He claims that there is a web of interconnecting secret societies, banks, businesses, health entities, education, political parties, security agencies, media owners, and so on. This network is working on evolving a One World Government. Icke: Network today 1999 All these claims sound crazy and are hard to accept. But what if these are true? Well? You be the judge of whether all this history and conspiracy theory information is valid and possible. This author merely brought all this information to you in one unifying article. There is still more detailed information but you can find it on your own. One piece of information that you cannot deny is that the USA government has been hi-jacked by vested money making entities and we, the people, need to take the government back. Have you become a more informed person now that you have explored this article and its contents?